Music Moves Europe which was supported by the 30 European associations and Organizations that attended the meeting, will be allocated a budget of 1.5 million Euro to begin the preparatory phases for a specific law on music, similarly to the process undertaken for the audio-visual law. Our partner ELMA and the 29 other organisations representing the European music sector welcomed this pilot programme for music in Europe and addressed Jean-Claude Juncker, President of the European Commission, to support a full European Music Programme in EU future budget. 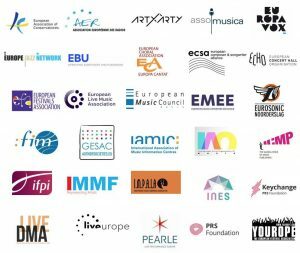 Read the European Music Sector Representatives letter here. The support of Music Moves Europe project by the European Parliament and the Directorate General for Education and Culture paves the way to create a legitimate music program that will contribute triggering larger investments in the sector, increase the diversity and mobility of the artists and the repertoire across national and European borders. 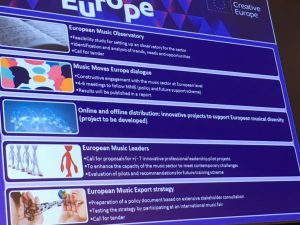 Tibor Navracsics, Head of the Culture Commission, presented Music Moves Europe guidelines in 5 points and outlined the scenario for the prompt approval of a law on music. 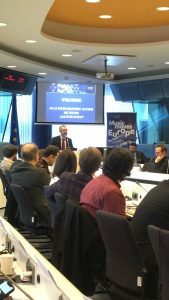 The EU wants to create a financial framework for the music sector in Europe in the coming years, and the newly launched “Preparatory Action” by Music Moves Europe is intended to put ideas and projects to the test and to work out the general conditions of the future funding program. 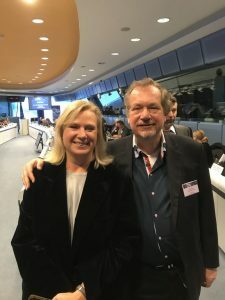 The conference gave ELMA Association President, Vincenzo Spera (Assomusica Associazione) and ELMA Vice-President, Prof. Jens Michow (Federal German Association of Entertainment and Music Event Industry – BDV) an opportunity to present #ELMAinitiative for the first time officially at the European Commission. Besides, all players in the industry will now need to work hard to ensure that the framework conditions of the program are efficient and that the resources available are commensurate with the importance of the industry, and not too far behind the budgets of other programs. As Vincenzo Spera commented, “The European Union is focusing on music and culture and this is where we must step in, along with the major European music associations, with whom we have worked for two years”. The preparatory action has set the basis of a programme that will overcome the gap in the current cultural policy of the European Union and “Music Moves Europe is a first step towards creating a promotional program tailored to the needs of the music industry,” commented Prof. Michow. The launch of the support program is expected – according to parliamentary decisions – only after the current program expires in 2020. The main objectives of the program are the professionalization of artists, the promotion of entrepreneurial investment and innovative startups in the music industry, the collection of data and metadata of the industry as well as the increase of export activities in the field of music. In addition, the project aims to help master the challenges facing the music industry as a result of technological change or digitization. The next step is a tailor made European music program with a budget that reflects its economic, social and cultural contribution. For the time being, to ensure Music … Moves Europe for many years to come, please spread the appeal as much as possible. 16. February, 2018 in News.